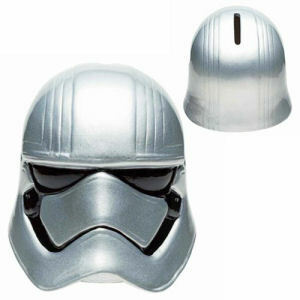 We have Just Sold out of Star Wars The Force Awakens Captain Phasma Ceramic Molded Bank. This Item is unavailable at present. From the Star Wars The Force Awakens collection by Zak Designs. Star Wars The Force Awakens Captain Phasma Ceramic Molded Bank. Ceramic Molded Bank measures about 4.5 inches tall and comes packaged in a closed box. Hand wash only. Not dishwasher safe. Ages 3 and up.